George Graham reviews Madeleine Peyroux's "Anthem"
In the early 2000s, there was a revival of popularity in the chanteuse style of vocalist, women singers with a mix of jazz, theatrical and cabaret influences. The best-known was Norah Jones, but preceding Ms. Jones’ debut album in 2002 by about six years was the appearance of Madeleine Peyroux, whose own first release Dreamland appeared when she was 22. It attracted a lot of attention at the time, with many observing that her style drew influence from the great jazz singer Billie Holiday. After the stir caused by that record, Ms. Peyroux retreated from the recording scene for some eight years, before returning in 2004 with Careless Love., after which she has remained active releasing a variety or musical projects, most of them collections of interpretations of the songs of others, from country artists to rockers to traditional songs. She has just released her ninth album called Anthem and it’s her first in about 10 years consisting of mostly original music. Her last album was a project called Secular Hymns, with cover tunes from various sources recorded with a simple trio in an old church in England. The new album is pretty much the opposite of that, with more elaborate production and original songs. Ms Peyroux describes it as her “biggest project to date.” This record was a collaboration musically, in that a band was assembled and they wrote most of the songs together. The bulk of the song creation occurred during the 2016 election, and the state of the world shows itself in several of the albums tracks. Some of the lyrical ideas came from her band members, who are singer-songwriters in their own right. The album was produced by Larry Klein, an eclectic bassist and producer who was married to Joni Mitchell and produced several of her albums. Others in the band and composing collective include guitarist David Baerwald, keyboard man Patrick Leonard, known for his work with everyone from Ronnie Raitt to Bruce Springsteen; and drummer Brian MacLeod. Other regular musicians on the album include guitarist Dean Parks, a ubiquitous studio player, and Pete Kuza on the frequently heard organ and other keyboards. There are various additional players, including jazz harmonica man Gregoire Maret, and Maxine and Julia Tillman Waters on backing vocals. 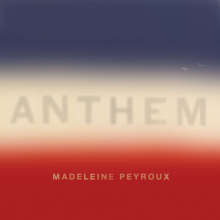 The album’s title, Anthem, by the way, comes from the one cover song, a Leonard Cohen composition, and Ms. Peyroux lists the late singer-songwriter first in her list of thank-yous in the album’s credits. The album ends with Liberté a piece based on a poem by Frenchman Paul Erluard, which came to the attention of Ms. Peyroux when she was asked to contribute a song to a documentary film about gravely ill young man. The poem in French, well-known in France, was set to music by Ms. Peyroux and her band, and features an introspective-sounding setting but with a string arrangement. Madeleine Peyroux’s new ninth album Anthem is one of her more ambitious, with its being almost all original music, and with a regular band collaborating with her not only on the arrangements but in the songwriting. As usual, Ms Peyroux’s vaguely world-weary sounding vocals are first rate and underscore her position as one of the leading chanteuse revivalists. The production is more elaborate than most of her previous recordings, but it remains tasteful, something that producer Larry Klein has made a career doing. Sadly, we’ll give the album no better than a C+ for sound quality. The recording is dull and cold sounding, with virtually no dynamic range. It was horribly over-compressed to the point that it sounds like the artifacts of a bad, overdriven analog recording. I found it unpleasant to listen to on a good sound system or headphones. Veteran mix engineer Tchad Blake ought to know better than that. It seems hard to believe but it has been 22 years since the release of Madeleine Peyroux’s debut album. Over the years, she has been taking her chanteuse style in different directions nicely, and on Anthem, shows her chops as worthy songwriter.